Wear your Angel's Heart for everyone to see. Keep their spirit close and spark their memory. 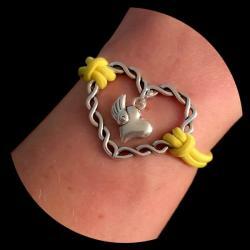 The Twisted Heart Halo Bracelet by HEAVENSBOOK ANGELS™ is to be worn by anyone who has an Angel in Heaven. The open Heart upon your wrist has no beginning and no end, symbolizing the infinite love you share with your Angel. Makes a meaningful sympathy gift for yourself or anyone who is struggling with the loss of a loved one. Perfect for funerals, birthdays, angelversaries, holidays, remembrance functions, fundraising, or any heartfelt gesture. Each Bracelet arrives individually gift wrapped inside a sheer organza bag containing the descriptive HEAVENSBOOK HALO Card and a complimentary large white Angel feather.